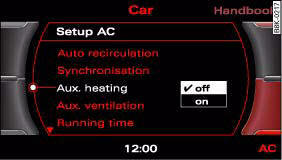 The auxiliary heating ^ works in conjunction with the air conditioner system, but does not rely on heat from the engine. Instead of this, the system burns fuel. The system's main function is to warm up the interior of the vehicle and to defrost the windows in cold weather. • Immediate start: You can switch the auxiliary heating/ventilation on and off at any time via the sound system or MMI. You can also switch the system on and off using the remote control. 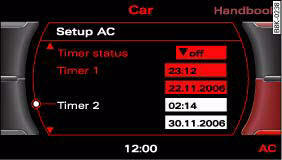 • Switching on via timer: You can programme various start times using the timers. 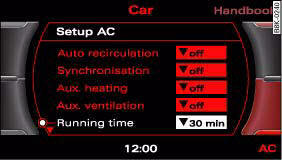 However you must first activate the timer before the auxiliary heating/ventilation system will switch on automatically. You can switch the auxiliary heating/ventilation on and off immediately via the sound system or MMI*. – Select: Function selector button CAR > control button AC > Aux. heating or Aux. ventilation. You can make the desired settings for the auxiliary heating/ventilation on the sound system or MMI*. – Select: Function selector button CAR > control button AC > e.g. Timer 1gggggg 111, fig. 122. 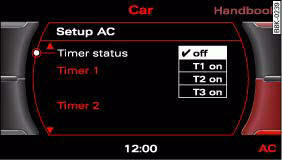 – Select: Function selector button CAR > control button AC > Timer status ⇒ fig. 123. Three timers are available for the auxiliary heating/ventilation. You can set a starting time and running time for each of the timers. When the time set on one of the timers elapses, the date automatically changes to the next day and the Timer status is reset to off. You have to activate one of the timers (e.g. T1 on) before it will switch on the auxiliary heating/ventilation at the time you have set. This prevents the auxiliary heating/ventilation from switching on when you are not using your vehicle. Before activating the timer, make sure that the correct time and date settings have been entered. If the time and/or date are not correct, the auxiliary heating will come on late or not at all. Please refer to the MMI Operating Instructions for information on how to set the date and time. You can set the running time on the sound system or MMI*. – Select: Function selector button CAR > control button AC > Running time. 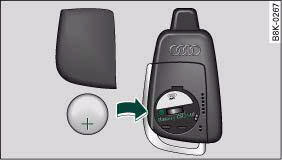 – Press the button for about 2 seconds to activate the auxiliary heating/ventilation ⇒ fig. 125. – Press the button for about 2 seconds to switch off the auxiliary heating/ventilation. 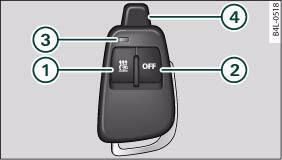 – Push back and remove the battery cover on the remote control ⇒ fig. 126. – Change the battery. The diagram in the battery compartment shows how the battery should be fitted. The new battery must be of the same type as the original one. – Re-fit the battery cover. When it is switched on, the auxiliary heating or auxiliary ventilation starts immediately and remains on for the period set in the menu. The maximum running time is 60 minutes. When you switch the system on by pressing the button 1 the indicator lamp will flash green for about 30 seconds to confirm that the heating/ventilation has been switched on. When you switch the system off by pressing the button 2 the indicator lamp will flash red to confirm that the heating/ventilation has been switched off. When the battery of the remote control is almost completely flat, the transmitter indicator lamp will not light up and no commands will be executed. The range of the remote control transmitter is about 600 metres. However, this can be greatly reduced by obstacles (buildings, etc.) between the remote control transmitter and the vehicle. Hold the aerial 4 upright when using the remote control.